Infinite Peripherals is a group of hardware add-ons that can be integrated to iPhone/iPad devices. These peripherals, once connected, helps iOS devices to do more functions which it cannot do by itself. For example, a Linea Pro device, once connected with an iPhone, can be used to swipe credit cards, read barcode/qr codes etc. More importantly, an iOS application can communicate with these hardwares and read data from them. Apple iOS devices are capable of doing many things out of the box. But there are things it cannot do natively because of its hardware limitations. Don’t you think its sensitive touch screen and attractive user interface can be useful in a POS terminal? But a POS terminal needs hardwares like barcode scanner and Magnetic stripe readers. These devices can be connected to a computer, but how can we connect them to an iPad/iPhone? This is where Infinite Peripherals comes in. The Infinite Peripheral hardware devices can be plugged right into the iOS devices without the need of any external connector. 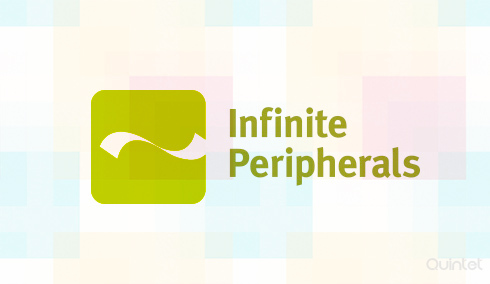 Infinite Peripherals provides an SDK which can be easily integrated with any application. Once the SDK is integrated and hardware is connected, any iOS application can communicate with these hardwares. You can Swipe conveniently—and securely—run cards through the 3-track mag-stripe reader. You can Scan and read all the most widely used barcodes in business today. We have been doing POS related applications for years and we have good experience in working with Infinite Peripheral hardwares. We have already used hardwares like Infinea Tab, Linea Pro as well as their SDK. We have developers who have experience in writing POS applications in both iOS as well as Android platforms. They possess deep knowledge on how applications communicate with external accessories, how third party SDK’s are integrated etc. As POS applications deal with credit cards and money, data security is of importance. Our developers are familiar with different encryption mechanisms, different security precautions and are committed to make sure that data and money are safe. As more and more retailers used mobile point-of-sale technology these days Infinite Peripherals is making their mark. Many businesses choose Apple devices such as iPod, iPhone or iPad along with peripherals that have been approved by apple. Even though peripherals are fairly simple to operate, they quiet aren’t that ‘plug and play’ type. It requires personalized custom software to capture MSR, Bluetooth, RFID or barcode information, along with seamless printing. Select an application that is compatible with infinite peripherals from the app store. Develop an application for internal enterprise. Develop and app and distribute it publicly via app store. We help retailers to create app for infinite peripherals. Demand for mobility is increasing in todays market and it is better to get your app listed in the appstore as early as possible to reap the benefits. We have access to infinite peripheral’s sdk and all needed resources which will enable us create the best solution for you. We can cater all your requirements by customizing your app. We can submit your app to the iTunes store, and guarantee its approval. After the app releases, our staff can train you on how to use the mobile point-of-sale app. Wintec supplies compact, customizable Point Of Sale (POS) devices which supports external hardwares. These devices run on customized Android OS which can host other system or application level softwares. Quintet helps you to integrate your dream applications that run on Wintec POS devices. MagTek is one of the main manufacturers of electronic devices and systems for the transmission and security of cards, PIN checks and other identification documents.At Quintet our team integrates the Magtek library into apps and read the data from it. We offer Secure Payment Services. Extending the features of your apps to wearable device should be fun. We, at Quintet have a team, working on developing apps for Android Wear. Connecting your phone to your smart watch and getting messages, notifications, weather updates, news etc on your wrist will change your life for sure. Android offers rich, extensive user interface along with smooth touch based navigations with support for real world gestures like swipe, pinch etc. Android enhances the user experience to a new level with its responsive user interface. At Quintet we will help you to design and develop your Android Apps. Casting data on small screens to large screens is efficiently made possible by chromecast. We have been working on enabling this feature on all possible apps developed in iOS and Android. Here we deliver apps which are cast-ready and you can even convert your mobile to a game joystick. Boca Systems consists of a series of high speed thermal printers that can be used to print tickets, receipts, labels, wristbands etc. Quintet can help you in Building a POS or Kiosk application from scratch which can efficiently work with Boca systems controlling them using FGL. Quintet is one of the leading iPhone app development, iPad app development and Mac development companies located in India. We have created numerous iPhone apps for our clients and got them reviewed and approved by Apple’s App review board thereby getting them listed in the app store. OS driven gadgets have revolutionized the gadgets market. Google Glass, Android and iOS wearables, Chrome Cast, Nexus Player etc. are all OS based and can be tweaked and manipulated with awesome apps and ideas. At Quintet we help you create apps for these cool gadgets or fine tune your existing apps to support all these platforms.